After hitting the island with tremendous force, Hurricane Maria's winds and heavy rains have caused flooding, destruction of infrastructure, and collapse of power lines and communications. 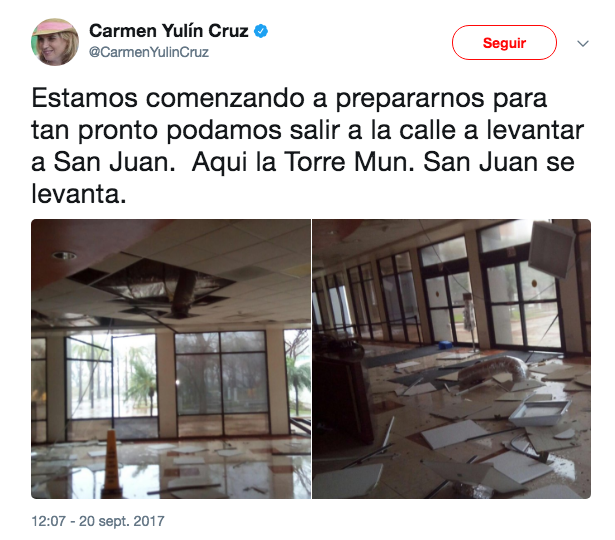 At 11 o'clock in the morning, the mayor of San Juan, Carmen Yulín Cruz Soto, stated, "the number of houses in Villa Palmeras and Cantera that are destroyed is difficult to process." The mayor of Cantaño reported something similar in the area, which he described as "totally flooded": "water got into the houses. The houses have no roof. Most of them are made of wood and zinc, and the power lines fell on them, "he said. Zones such as Baldrich, Israel, Sierra Maestra, Plebiscito, Embalse San José and Valencia, are completely flooded, according to local media and citizens through their Twitter accounts. To make matters worse, the Puerto Rico radar was lost during the catastrophe, and meteorologist John Morales reported at noon on Wednesday that the National Hurricane Center would not be updating the hurricane's position every hour, explaining that the intensity of the typhoon’s tail was difficult to determine. According to the director of the State Agency for Emergency and Disaster Management (AEMEAD), Abner Gómez, "100% of the subscribers of the Electric Power Authority" would be without light on the island, which would make it difficult to specify the damages by the Aqueduct and Sewer Authority, whose main building suffered serious damage. Gomez sadly stated, "When we can leave, we will find our island destroyed". Echoing that feeling, Governor Ricardo Rosselló asked US President Donald Trump to declare Puerto Rico a disaster zone. In response to the request, the Office of the Federal Affairs Administration in Washington has called a meeting with sectors of the Puerto Rican community to discuss recovery efforts on the island, El Nuevo Día reported. Right now, the population of Puerto Rico suffers an important block of communication between its municipalities because of the heavy damages that has suffered the infrastructure of the island. This has hampered immediate responses and the initiation of damage assessment.